The Circles for Rice project has reported record third-year yields in rice production across five research fields and 16 production fields in multiple countries. Organised by Valmont Irrigation, the Circles for Rice project is an initiative that explores the production of rice under centre pivot and linear machines in an effort to increase grower profitability, explore a new crop to add to the rotation, expand the area in which rice can be produced as well as conserve water and other resources. In 2010, Valmont Irrigation assisted with five research fields collectively in the United States and Brazil in addition to managing 16 production fields in the United States, Brazil, Pakistan and Ukraine. Dennis Robison produces rice on his farm located near Neelyville, Missouri in USA. While a large part of his fields is well-suited for flood irrigation, one particular field has sandy soil and hilly terrain, making it impossible to produce rice. Dennis used a Valley centre pivot to grow a RiceTec hybrid rice on this field, producing a dry weight yield of 8.8 mt/ha. He applied just under 560mm of water during the season, which is half of the quantity of water he uses on his traditional rice fields. Mario Tuyama produces rice in Paracatu, Minas Gerais in Brazil. Mr. Tuyama began working with Valmont Irrigation as part of the Circles for Rice initiative to produce rice under centre pivots. Mr. Tuyama has been producing rice using his Valley centre pivot since 2000 and could average only below-optimum yields. With minor management adjustments suggested by the Valmont Irrigation Circles for Rice team and a new rice variety, Mr. Tuyama was able to double his average yield to a dry weight of 6.1 mt/ha. He produced an 8.1 mt/ha dry weight yield with the variety BRS Taim, one of three rice seed brands Mr. Tuyama planted in 2009. 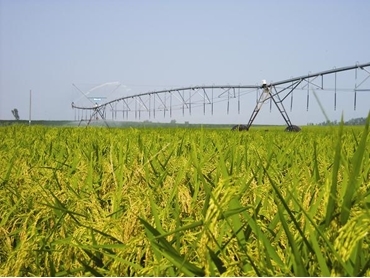 Throughout the 2010 growing season, Valmont Irrigation collected data on traditional and non-traditional rice fields in addition to recording cost savings that rice producers have experienced with centre pivot irrigation over traditional flooding methods. Overall, a grower who produces rice with a centre pivot can still be 5% more profitable, even with a slightly lower yield, than if he had flooded his field. Though a rice producer may use more pesticides and herbicides with a centre pivot, the fertiliser costs remain the same as with a flooded field. Rice fields irrigated with centre pivots do not need to be flat and many crop protection products can be applied using the irrigation machine. Consequently, growers may see a 75% or more reduction in labour costs and 50% or more difference in maintenance costs. Compared with a flooded field, fuel costs are also lower for rice produced with a centre pivot due to a significantly smaller volume of water that is pumped throughout the growing season. Valmont Irrigation has partnered with several organisations and universities for this project including RiceTec, the University of Missouri Delta Research Centre, the University of Arkansas, Agricentre International, Embrapa and Irga. The Valmont Irrigation Circles for Rice project has been in progress since 2008.